THE residents of Medan Damansara want the Anti-Corruption Agency (ACA) to investigate the Damansara 21 development project. The residents announced this yesterday, after a retaining wall collapsed on Wednesday evening during a downpour, followed by a landslip at 4am yesterday due to soil erosion from the hill near the their area. One house was badly affected by the incident with cracks appearing on the walls and mud gushing through the kitchen door. Two families have been evacuated as a precautionary measure. Unsafe slope: Construction workers clearing the debris where the landslip occurred. According to the Medan Damansara Residents Association committee member Randhir Singh, they want to know if proper procedures were followed with the regards to the project. “We had foreseen this incident but our cries fell on the deaf ears of the Kuala Lumpur City Hall (DBKL),” he said. “The family affected by the incident is traumatised and had to leave the home because it was no longer safe,” Randhir said. “A fire department official told them that it was going to get worse and it did, when the soil erosion happened. “The officer had also asked the next door neighbour to move out,” he said. “The project is neither residential nor environment-friendly. The DBKL, however, seems to be developer-friendly,” he said. Randhir said the project should be scrapped and the hill restabilised. Segambut MP Lim Lip Eng, who visited the site, said he had received anonymous SMSes blaming the residents. Dr Patricia Ambrose, whose family has been asked to move out, said she was fed up with the whole issue. Investigations please: Lim (right) with the Medan Damansara residents at the affected house. “The developer assured us that nothing would happen but it did. They said that it was safe but it is not. “So, we have to stay away from our home,” she said. “I think another downpour will cause the whole hill to collapse.” Patricia said. Deputy Federal Territorries Minister Datuk M. Saravanan, who visited the site recently, said the ministry was concerned over the issue. He said the ministry had issued a stop-work order to the developer in November last year after the residents complained about the risk. “The developer was not given the approval to start development. Its workers were only clearing the place but even that proved dangerous,” he said. Saravanan said if all the legal documents were intact, it would be difficult to stop the project because it was on private property. “However, if the developers failed to provide the necessary documents, we will issue the stop-work order,” he said. Scary sight: Workers can be seen clearing the eroded soil through the windows of the affected house. Asked about the residents’ intention to take the matter to the ACA, Saravanan urged the residents to do so if they thought they had a case. “The ministry and the DBKL do not have any vested interest in the development project but if the residents have proof of corruption, then they should definitely lodge a report,” he said. Dr Masitah Mansor (left) inspecting the damage outside her house yesterday. KUALA LUMPUR: Stop it now before someone is killed, demanded Damansara Heights residents after a landslip at the Damansara 21 project site on Wednesday here foced two families to abandon their homes. The Damansara 21 project site on Wednesday here foced two families to abandon their homes. Medan Damansara Residents Association assistant secretary Randhir Singh said the association had warned City Hall and the developer that it was too dangerous to proceed with the project. “We repeatedly told them that it was not safe to build houses on the hill but they ignored us. Linda Abdullah, a maid at Dr Masitah Mansor’s house, showing the kitchen door that was almost broken by the landslip. Selangor Dredging has started earthworks for 21 luxury bungalows priced between RM10 and RM15 million each on a hill slope. City Hall approved the project in June, saying the developer had not contravened any conditions and regulations set by the Drainage and Irrigation Department and the Minerals and Geoscience Department. Yesterday, Deputy Federal Territories Minister Datuk M. Saravanan, who visited the site of the landslip, said City Hall had only approved land clearing but not construction works. 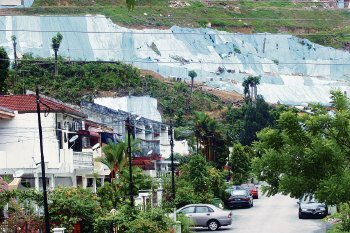 Two families in Jalan Setiapuspa 1 fled their houses after a landslip at 5.15pm on Wednesday forced the zinc fence wall of their homes to collapse. Dr Marsita Mansor, whose corner house was badly affected, estimated damage to her home at more than RM1 million as the family had carried out renovations before moving in six months ago. The family and their neighbour were told by the Fire and Rescue Department to vacate the houses over fear of more landslips. The landslip destroyed the side-wall fence near the sliding door and almost broke the kitchen door. There were also cracks on the kitchen wall and tiles. The two affected families are staying with friends in the area after rejecting an offer by the developers to house them in a hotel. KUALA LUMPUR: The developer of the Damansara 21 condominium project in Medan Damansara here will pay for the damages incurred by the two families who had to be evacuated when a retaining wall behind their homes collapsed during heavy rain on Wednesday. Kuala Lumpur Mayor Datuk Ab Hakim Borhan, who visited the site last evening, said the developer would rebuild the retaining wall for the affected houses. He said the developer would remove soil from the slope and cement it to prevent mud from flowing down. “The rectification work will take seven days to be completed and the developer will pay for the damages incurred by the families,” said Hakim. The victims are now staying at a nearby luxury hotel. According to Hakim, DBKL had been conducting checks at the site every Friday. He added that the developer had asked for permission to build a U-shaped drain along the edge of the slope from Lorong Setiapuspa 1 till Lorong Setiapuspa 3. “The soil erosion was caused by water that saturated the soil, so the solution now is to drain the excess water,” Hakim said. The developer refused to comment but its consultant, Y.Y. Guo, said they preferred to address the safety issues and to help the affected families. Guo added that they would prepare a report in the next few days and hand it in to DBKL. KUALA LUMPUR: Developer Selangor Dredging did not give City Hall the “complete picture” when it submitted an application to develop Damansara 21, Deputy Federal Territories Minister Datuk M. Saravanan said yesterday. Saravanan was commenting on a landslip near the Damansara 21 development site, which forced two families to flee their homes. He said City Hall initially approved the developer’s development request as it was on privately-owned land and it had met all conditions and guidelines. “We didn’t approve it for development. KUALA LUMPUR: Parts of Kuala Lumpur, Petaling Jaya and Kajang were hit by flash floods during Wednesday’s evening downpour that started around 5pm. Jalan Travers, Pudu Raya and Jalan Bangsar were the affected areas in Kuala Lumpur. The Smart Tunnel was closed from 7pm onwards to divert floodwaters. The floods in Kuala Lumpur hit several areas that were undergoing hillside development approved by KL City Hall (DBKL) but which were objected to by residents. The worst hit area, Jalan Travers, is next to Federal Hill where three blocks of high-rise buildings were earlier proposed but strongly opposed by residents. The construction for police quarters is being carried out on the site. Hundreds of motorists were stranded along the stretch temporarily as they could only wait until the floodwaters had subsided. A police spokesman said the floods had caused massive congestion. “There was nothing much we could do as we could not get out of the Jln Travers police station, and fire trucks could not get to the scene due to the traffic jam,” she said. Meanwhile, a retaining wall separating Medan Damansara and a hill on which the controversial Damansara 21 development was carried out collapsed at 5.30pm. One house at Lorong Setiapuspa 1 was badly affected. Mud flowing down from the hill covered the entire area. The occupants of the two houses nearest the hill were advised to vacate the premises. Deputy Federal Territories Minister Datuk M. Saravanan, and personnel from the Fire and Rescue Department and DBKL also visited the site. DBKL’s Drainage and Irrigation Department director Hooi Yoke Meng said the water retention pond built behind the Caltex petrol station there had helped alleviate the flood situation at Jalan Travers. He said the pond was a temporary mitigation measure carried out by DBKL after the area was flooded in April. Run-off from Federal Hill had been diverted into the pond instead of drains. “Traffic resumed, albeit slowly, within a short time even though the volume of rainwater was as much as in April. Our personnel were deployed to the site to manage traffic and some helped pump rainwater into the pond,” he said. He said out that one of the long-term measures was to have another water retention pond there to trap rainwater from flowing into Jalan Travers. Hooi also said that DBKL personnel had been clearing silt deposited into drains aggressively at various parts of Kuala Lumpur during this stretch of rainy days, but “the rain was like a moving target”. He disagreed that construction projects being carried out on Federal Hill had contributed to the flash floods. “All development must abide by our policies under the New Urban Storm Water Management whereby developers should have structures on their sites to trap water, and thus should have zero-contribution towards flash floods. DBKL enforces and monitors this,” he added. In Petaling Jaya, traffic at Jalan Universiti heading towards the Federal Highway was at a crawl from about 6pm onwards because of flash floods at the flyover. At about 8.30pm, the situation worsened as traffic from all directions was concentrated at the junction of Jalan Universiti and Jalan Dato Abu Bakar. A MBPJ Hotline officer confirmed that there were reports of flash floods at Jalan Universiti and Persiaran Surian, Kota Damansara in Petaling Jaya, but the water has subsided by about 9pm. In Kajang, Jalan Reko was also badly hit and resident K. Amarakaran, 55, said it was the worst he had ever seen. “Tomorrow is the first anniversary of my mother’s death and the house is filled with mud. The water started rising at 4.30pm and only subsided at 6pm,” he said. Selangor Menteri Besar Abdul Khalid Ibrahim today reiterated his state government was not planning to withdraw a ban on hillside development, but would continue to listen to all views including those of developers and landowners. “We haven’t changed our view but we are giving the people a chance for reassessment,” Khalid said. Khalid was speaking to reporters after chairing a dialogue between representatives of residents’ associations, NGOs, housing developers and real estate groups. The PKR leader and his state exco colleagues, Teresa Kok and Ronnie Liu, recently came under fire after a news report suggested they might be considering lifting a recently imposed ban on development projects on slopes having a gradient of 25 degrees and above, technically referred to as Class 3 and Class 4 slopes. Hillside development has been a thorny issue with voters in the state and Khalid’s team had come to power during the March national polls on promises they would continue to prohibit such practice. Khalid also denied that Kok and Liu were in favour of lifting the ban, adding that the duo merely sought to listen to all sectors. “We thought it was a good idea. So we called them to discuss,” he said. “This is the first time, maybe, in Selangor that we have a town hall meeting between two bodies that have been confronting each other, but who are now able to sit down in a civilised manner and find improvement for the state. “One of the developers said it was a good thing and should have been done 20 years ago, so this issue would not have arisen,” Khalid added. The menteri besar insisted his state government would not stop any quarters from airing their grievances, even after decisions had been made. His government would practice a “continual assessment” policy in all its decisions, he stressed. “If you say you have made a decision and then you say, ‘I don’t want to hear anymore (views)’, (that is) lacking in good judgment,” Khalid added. A delegation of representatives from 8 RAs were at DBKL office in KL this morning to hand over some 1240 objections from residents who were highly concerned at Draft Kuala Lumpur City Plan. President of Coalition to Save Kuala Lumpur (CSKL), Tan Sri Abdul Aziz Abdul Rahman and CSKL legal advisor, Derek Fernandez both explained to the Press present to witness the handing over, some of the key objections to DKLCP. There were 10 key generic objections, covering the illegality of DKLCP, the Public Opinion Hearing Committee, Population Density assumptions, Transportation, Environment and many other areas that were inadequately covered and explained. Objections also covered two key areas, Federal Hill and Bukit Gasing, that glaringly demonstrates in more specific manner the deeply flawed and poorly considered DKLCP. CSKL also highlighted that many more objections had been submitted directly by RAs across KL and many more residents will be submitting more up to the closing date of 31st August. Derek Fernandez also highlighted that it is wrong for DBKL to suggests that this Friday (29th August) would be the last day as legally when closing date falls on a weekend or public holiday, then the closing date will be the next working day. Again, this illustrates the high handed manner DBKL discharges its responsibilities to the public it claims to serve. Please look out for press reports for more information. On the 15th of May 2008, DBKL made available to the public its Draft Kuala Lumpur City Plan (DKLCP). DBKL initially set the closing date for objections for 30th June, a mere 6 weeks for review and present objections. Public anger resulted in the Mayor extending the closing date to 31st August. For a plan that took 26 years to be drafted, the Mayor still expects affected residents to analyse a deeply flawed DKLCP and respond in about 15 weeks. Is this right for a city that aspires to be World class? Many residents, elected representative and concerned citizens have voiced their concern on many aspects of the DKLCP. Publishing the DKLCP without adequate publicity and involvement of stakeholders is illegal. Withholding of Volume three of the DKLCP from public scrutiny causes many concerns. The DKLCP is complex, lacking in vital information for objective review, non complaint to National Physical Plan, National Urbanisation Policy and its own Kuala Lumpur Structure Plan 2020 sums up the quality and transparency of the draft city plan launched by the Mayor. Town planners involved in drafting the DKLCP hint at political pressures. The Coalition to Save Kuala Lumpur(CSKL) with assistance from Derek Fernandez (CSKL Legal Advisor, Urban Planning lawyer and MBPJ Councillor) had been working on a detailed and objective response to the DKLCP. The President of CSKL, Tan Sri Abdul Aziz Abdul Rahman have been campaigning hard against the deeply flawed DKLCP, with many press statements and meetings with elected representatives to explain the very flawed and damaging nature of the DKLCP. Note: If you do not wish to be involved in submitting verbal objections to the Public Opinion Hearing Session, answer Part C as ‘No’. Also, if you are submitting as an individual, leave ‘Agency/Organization’ in Part B as blank. Please do this before 31st August 2008. KUALA LUMPUR: “We ran out of tranquilisers.” That was the response from the city’s Wildlife and National Parks Department after it came under fire for gunning down monkeys in Medan Damansara last week. Several residents, horrified to see blood-splattered monkeys dying from bullet wounds, phoned the NST to express their disgust. A resident in Medan Damansara said he rushed a severely wounded money to a veterinarian but the animal could not be saved and had to be put out of its misery. Another resident claimed that a baby monkey, suffering from gunshot wounds, shrieked in agony for hours before a passer-by picked it up and rushed it to a veterinarian but it died later. The wildlife department said it shot dead 10 monkeys on that day but some residents claimed that they saw many monkeys being killed. The department confirmed that the carcasses of the monkeys were removed after the shooting. “We ran out of tranquilisers,” said department director Jamalun Nasir Ibrahim when asked why the monkeys were shot. “We apologise for the dismay caused by the shooting. We assure the residents there it will not happen again,” said Jamalun. Jamalun said the department took action after it received more than 100 complaints from residents in the area about the monkeys. Under the Protection of Wildlife Act 1972, wildlife officers are permitted to kill wild animals or birds if they pose a danger to human life or property. The department has set up 12 traps in residential areas around the city, and they are checked daily with the captured monkeys relocated to other areas. It is learnt that the department wants to set bigger traps to catch the monkeys rather than carry out another culling exercise that might upset the public. KUALA LUMPUR: Monkeys are being forced out of their natural habitat and into residential areas by the building of bungalows on a hillside in Medan Damansara. That is what some residents there believe. As a result of construction on the hillside, monkeys have come out to rummage through rubbish bins, damage telephone lines, scratch cars and generally create a mess. However, many residents adopt a philosophical view, saying it was only fair to allow the monkeys to roam the residential area as it was humans who had destroyed their natural habitat due to development projects. “We disturbed the ecological system and this is the result. Like it or not, we have to make room for the monkeys,” said R. Thatchana, 40, an engineer who has lived in Jalan Beluntas the past two years. Another resident agreed that humans had created problems for the monkeys. “Where else can they go to look for food if they do not rummage through our rubbish? “My car got scratched because the monkeys liked to sit on the hood and I have to wash my car daily. My maid has been cleaning up after the monkeys,” he said. He strongly opposed shooting the monkeys as a means of solving the problem. “A better way would be to seek help from trained animal specialists,” he said. A hillslope in the area is being developed for luxury bungalow lots priced between RM6 million and RM10 million. KUALA LUMPUR: Medan Damansara residents have expressed shock and outrage at the killing of monkeys in their area by the city’s Wildlife and National Parks Department. Medan Damansara Residents Association secretary Peter Raiappan was disgusted. “No doubt, the monkeys have been a nuisance but we must remember that we are the ones who have ousted them from their natural habitat. “So what we expect the monkeys to do when they also need to search for food. I am simply speechless at the extreme measures used such as shooting the monkeys,” he added. Peter blasted Jamalun for letting his men use bullets instead of tranquillisers; Jamalun, being responsible for looking after wildlife in Kuala Lumpur, should have been more protective of the monkeys, Peter said. He also questioned Jamalun’s estimation that there are thousands of monkeys in Medan Damansara. “The monkeys who live in and around Medan Damansara do not number in the thousands. At the very most, there are about 100 monkeys,” he said. “The monkeys could easily have been caught over a period of time and relocated to other places such as Templer’s Park. “The department should be ashamed of its actions,” Peter added. Financial planner Steve Teoh, who lives in Jalan Setiabestari, said: ‘There must be a more humane way of dealing with the monkeys. Meanwhile, the Society for Prevention of Cruelty to Animals (SPCA) Selangor was shocked with the culling of the monkeys in Medan Damansara. SPCA public relations and marketing department assistant manager Jacinta Johnson said the association received reports from the public about monkey carcasses in the area. Jacinta said the SPCA did not support the methods used by the department as it caused the monkeys a lot of suffering. “Malaysia’s monkey situation is not unique and we can learn from the experience of neighbouring countries such as Singapore, Indonesia and Hong Kong. Three articles on the ways of our foresighted city planners — money talks, the rest can (take a) walk. Do your bit and sign up to oppose the Draft KL City Plan 2020. You have up to 31st August 2008. Datuk Seri S. Samy Vellu wants City Hall to provide accurate figures. KUALA LUMPUR: Datuk Seri S. Samy Vellu has taken City Hall to task over the draft of the Kuala Lumpur Structure Plan 2020. The MIC president pointed out that there are some major flaws in the draft plan that need to be rectified. “The draft plan states that the Federal Territory of Kuala Lumpur has only about 160,000 Indians, which I find strange. We have some 80,000 registered voters in Kuala Lumpur,” said Samy on Monday. “If one family had two children, then we have to multiply 80,000 by four. The figure will stand at 320,000 Indians. This is only an estimate based on the registered voters. What about unregistered Malaysian Indians? “Obviously there are some things that should be set straight before the draft becomes a policy,” he said after attending a briefing on the draft plan by City Hall consultants at the MIC headquarters here. He said the briefing, attended by MIC division heads and office bearers, had clarified several issues encountered by Indians living in the federal capital, which has about 2.5 million people. “We have studied the draft plan. We would submit our own recommendations on the plan to City Hall. “The issues raised included the squatter migration to low-cost flats, facilities at low-cost flats, future and existing Tamil schools and the fate of individual-owned land in Kuala Lumpur,” he added. The MIC chief also wanted City Hall to provide accurate figures and statistics concerning Malaysian Indians in the draft plan, so that those reading it could come to a fair and just conclusion and make appropriate recommendations. “This plan charts the future of the city for the next 12 years. If we are not given proper facts and figures, then our recommendations would also be flawed. “It would be better if Dewan Bandaraya tells us the exact figures and we work from there,” he added. The briefing was also attended by Federal Territories Deputy Minister Datuk M. Saravanan. Prior to Samy’s statement, non-governmental organisations and residents associations have also voiced their objection to the draft plan, which seeks to further develop the federal capital up to 2020.